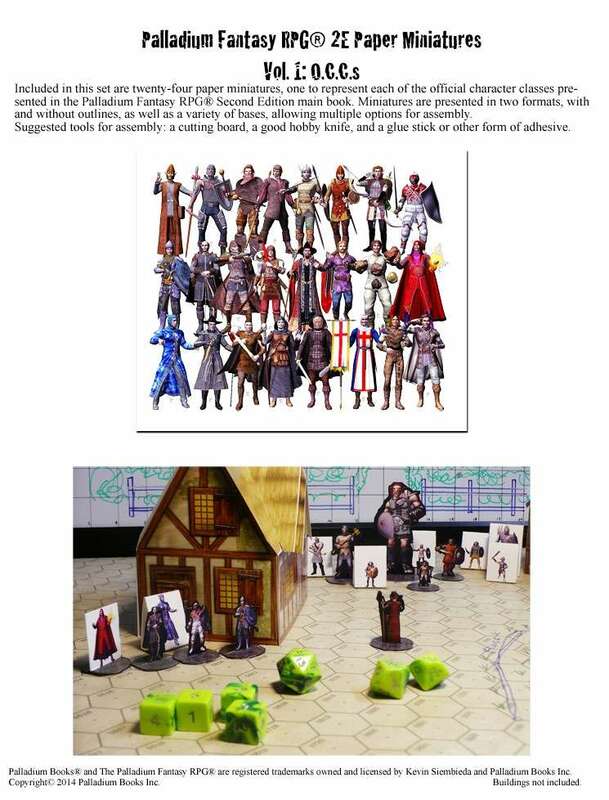 Included in this set are twenty-four paper miniatures, one to represent each of the official character classes presented in the Palladium Fantasy RPG®, Second Edition rulebook. Miniatures are presented in two formats, with and without outlines, as well as a variety of bases, allowing multiple options for assembly. Update, I've turned in three more sets to go into the store soon; Set 3: N.P.C. Encounters has a variety of 24 minis you might encounter during an adventure, from peasants to nobles, merchants to thugs and City Guards; Set 4: Undead has 15 Skeleton Warriors, 8 Zombies, four Vampires and a Necromancer; and Set 5: O.C.C. 's Female has all the classes represented in set 1 but in female versions. Right now I'm close to finishing set 6: Dwarves; This set will include 28 dwarves, 7 of which will be female. After that I'm working on Elves and Wolfen. The Great Horned Dragon has proved to be far more complex than I anticipated so the project is temporarily shelved; I don't want to put it out until I get it right. Love the paper miniatures, when can we expect female and dwarven versions? I'm working on a set of Elves and Dwarves, and have almost completed a companion set to set one that has a female version of each of the 24 primary character classes from the Palladium Fantasy 2E main book. First up is the Great Horned Dragon, hopefully by the end of next week, followed quickly by Additional O.C.C. 's (several Nobles, Peasants, thugs, town guards, etc.) and Undead. So for what you are asking, I'll estimate 4-8 weeks.. Sorry it took longer than expected. Set 3:NPC Encounters is out and has some female characters in it, and within the next few weeks Set 4: Undead, Set 5: O.C.C.s Female and Set 6: Dwarves will be out as well.